A distinctive gateway flanked by tall evergreens invites visitors into the Entry Court which the magnificent bronze sculpture ‘An Unlikely Landing’ and pond lead the eye to the beautiful central corridor view beyond. The sculpture was crafted by internationally renowned artist Frank Fleming and made its happy landing in the Garden in 2002. During that summer, more than 50 of Frank’s whimsical pieces were on display in the Garden. 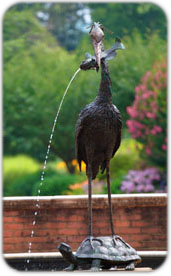 Generous donations enabled the purchase of the stately Great Blue Heron. Today, he is a Garden icon. A brick pathway meanders through the Four Seasons Garden, which contains a comprehensive collection of herbaceous perennials, hardy bulbs, vines, flowering shrubs, and small trees suited to the Tennessee Valley. Here, the Garden displays plants that may be an inspiration to gardeners and homeowners in our community. This is a place to revel in the sights and scents of flower beds and borders that line the river of emerald green grass flowing from the Entry Court to the Damson Aquatic Garden. Each of the borders has a theme, such as the Spring Border; Summer Board; Hot Colors Border; or Pink, Blue, and Silver Border. The numerous plantings within the raised beds reflect the theme. The pathway leads to the Aquatic Pavilion and Cottage Garden, an intimately scaled “dooryard” garden. The garden’s main entrance moves straight to the “cottage,” while the primary cross-paths terminate at arbor-covered benches set amid mixed fragrant and colorful plantings. You will be enticed to stay awhile and watch for butterflies dancing among the blooms and listen for the serenade of cicadas, bees, and songbirds.